The Japanese word “genki” is hard to translate thanks to its many potential English meanings. A quick online shows people romanizing it as “energy,” “happy,” “energetic,” “lively” and “enthusiastic.” It’s apparently also used in Japan as a quick way of asking how someone is doing. After much time and consideration, I have concluded the best translation of “Genki Genki Panic” is “a kickass mix of horror punk and surf from Tennessee.” But just who are these mysterious men in lucha libre masks? 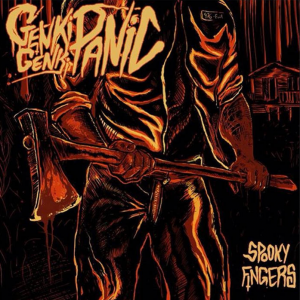 The story of Genki Genki Panic starts in Chattanooga, TN. It was there in late 2014 that guitarist Carlos Satana (then known as “Chanco”) and drummer El Fatsquatch first teamed up. Sometime after recruiting the bassist Larde, Fatsquatch had to leave the band due to health issues. A new drummer known only as Diazabaal joined for a few months in 2015 and his departure led to fill-in bassist El Dorido the Bionic Vaper Boy switching over to the drums. I also understand they have plans to add a new bassist and percussionist sometime as well! But don’t let the departures fool you. They’re all still friends and former members are free to (and have) return for special appearances. For those new to the group, let’s go back to the original lineup with Ghoulie High Harmony. Although they had released some practice room demos and the Vaya Con Diablos EP prior to that particular album, its status as their first full release makes it a perfect introduction to the sounds and style of GGP. “The Munge” has a wonderfully creepy surf opening with great percussion work. It later kicks up with a more a rockin’ feel at times (but still retains the creepy vibe). Don’t look up the song’s title online. Trust me on this. The guitars really shine in the speedy opening of “Drag The Lake (The Afterlife Aquatic).” The track has the feel of something nasty hiding just beneath the surface, watching and waiting for its next victim. Named after Robert Englund’s directorial debut, “976-EVIL” blasts out the gate with breakneck speed and effortlessly melds classic surf touches with a distinct modern surf feel. “Swamp Hands” 02:24 gives you the surf you crave with the reverb you need. The the slowdown segment and awesome ending making this required listening. The opening drumroll of “HPV Lovecraft” sets the stage for a most interesting beat which later transitions into a vaguely eastern European folk surf tune. In “Camp Crystal Lake,” the guitars set up a lurking, vaguely 60’s spy music feel for the bulk of the track and “Sexting The Dead” is like frozen preserves. That’s right, it’s a solid jam! “Slaughterhouse ’69” has a somewhat similar tone to first track. But that’s where the similarities end. I love the bursts of reverb and haunting musical wailing provided by the theremin. You could easily get away with blasting this on Halloween or in a homemade haunted house. “Your Body Is A Wasteland” may be incredibly fast, but it’ll never make you feel like they finished too quickly. The bouncy feel reminds me of waves, so this could be the perfect track to play to someone who’s having trouble understanding why this sort of music is called surf music. “The Spectrophiliac” has a very 60’s rock feel, right down to the use of percussion. There’s also plenty of eeriness to go around, so everything is just perfect. Listening to Ghoulie High Harmony made me realize something very important. There’s a big difference between horror surf and surf groups who occasionally tackle horror and sci-fi themes. 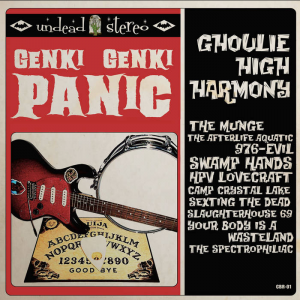 Although both are great, listening to Genki Genki Panic has reminded me just how different they are and how I’ve been missing out on horror surf for far too long. I’ll definitely be making a more concerted effort to seek out true horror surf for future installments of the Freaky Tiki Surf-ari. But seeing as how the band has changed its lineup since then, let’s check out their most recent release (as of this writing): the Spooky Fingers EP. The heavy but fast “Werewolf By Night” is named for the Marvel comic. But despite its namesake being a super hero, the opening scream and guitars really crank up the menace. “Two Girls, One Casket” has a soft and eerie opening which reminds me of a haunted music box, but it soon becomes the speedy surf we know and love. In addition to the dueling guitars and pipe organ, there’s a very Danny Elfman feel to this track. Try to imagine the sound of a cartoon character running around and you’ll have a good idea of what I mean. “Desecration” provides appropriately moody and soft instrumentation while “Phantom III ’37” opts for the speedy and (relatively) subdued. At least until the drums and cymbals cut loose at the end! In “When Bats Cry,” a Rob Zombie’s “Dragula”-style opening buildup leads to a bouncy reverb beat which shapes most of the song. It’s one hell of a closing number, that’s for sure. It’s also a tribute to both Prince and John Carpenter. Check their Facebook page if you don’t believe me! This album is proof positive Genki Genki Panic is not afraid to change their style up. But even with the changes, fans of the first album are sure to love this too. With a selection of influences ranging from the Ghastly Ones to Ennio Morricone and the skills back it all up, you’re sure to find something to love about their music. So pick up their albums and prepare to let the spooky surf goodness wash over you! Special thanks to Genki Genki Panic for use of the images!